Marc Chagall has had a long and wonderful relationship with the theater that stems from his first designing sets and costumes in Russia in 1914, when his “dreams sprang to life and became an actual movement.” (Cogniat). After leaving Russia, twenty years passed before he was again offered a chance to design theater sets. In the years between however, his works still included harlequins, clowns, acrobats, and musical motifs which Chagall scholar Cogniat notes “convey his sentimental attachment to and nostalgia for the theatre”. Famous set designs included Aleko, 1942 and Stravinsky’s Firebird, 1945 while he was living in New York, Ravel’s Daphnis and Chloë, 1958 in Paris and Die Zauberflöte(Magic Flute) in New York in 1967. With such love and respect for theater, poetry, and music, Chagall wanted to give back to that community and found that though celebrating art and culture by creating murals for theaters, his art could exist in a more significant way. Such accomplishments include a mural for the Moscow Jewish Art Theatre in 1921, the foyer of the Winter Gate Theatre in London in 1949, the foyer of the Frankfort Theatre in 1959, the ceiling of the Paris Opera in 1963, and in 1966 the foyer of the Lincoln Art Center- Metropolitan Opera House in New York. In this article we will discuss his work on the ceiling of the Paris Opera and the foyer of the Lincoln Art Center which were the inspiration for his most iconic lithographic works Romeo and Juliet, The Magic Flute, and Carmen. 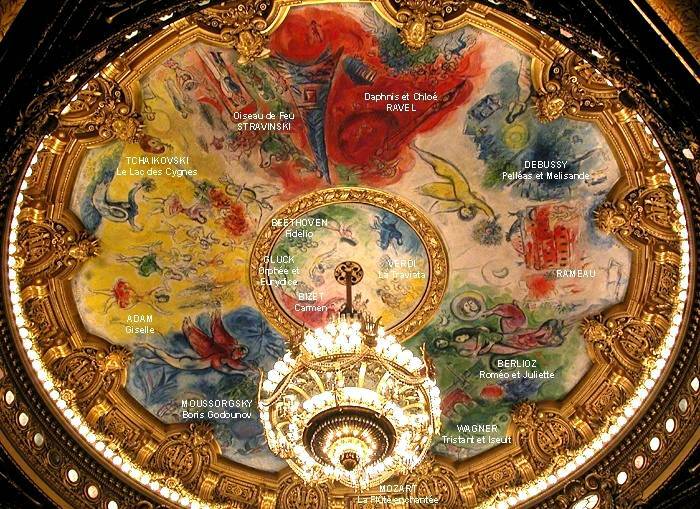 Having lived in his adopted country of France for more than five decades, in 1963 Marc Chagall was commissioned to paint the new ceiling for the Paris Opera, a majestic 19th-century building built by Napoleon III and considered a national monument. André Malraux, France’s Minister of Culture wanted something unique and decided Chagall would be the ideal artist after seeing Chagall’s work in Daphnis et Chloe. This choice however caused controversy as some objected to having a Russian Jew decorate a French national monument and others disliked the ceiling of the historic building being painted by a modern artist. There is no logic of time or space in the choice of themes, figures and symbols on his ceiling. The images Chagall painted paid tribute to the composers with scenes from Mozart’s The Magic Flute, Wagner’s Tristan and Isolde, Mussorgsky’s Boris Godunov, Berlioz’s Romeo and Juliette, Ravel’s Daphnis and Chloe, Stravinsky’s The Firebird, Tchaikovsky’s Swan Lake, and Adam’s Giselle; Paris’ monuments such as the Tour Eiffel, the Opera Garnier, Place de la Concorde, Arc de Triomphe and typical Parisian rows of houses on the riverside; French musicians such as Rameau, Debussy, Pelléas, and Mélisande; plays such as Carmen, Orfeo, Fidelio, and Verdi; famous composers such as Gluck and Beethoven; and the typical Chagall motifs of angels, lovers, animals, fauns and satyrs. All of which Chagall manages to combine in the same space through the use of wonderful rich colors, an echo of his long experience with the world of theatre. Far from the reach of man however, one of the sketches, Romeo and Juliet, based on a scene from the ceiling was created into a lithograph edition and is one his most highly valued works today. Chagall’s interpretation is taken from Romeo and Juliet, an opera in five acts composed by Charles Gounod to a French libretto by Jules Barbier and Michel Carre, based on The Tragedy of Romeo and Juliet by William Shakespeare. Romeo and Juliet is set in Verona, Italy, where an ongoing feud exists between two powerful families: the Montagues and the Capulets. Romeo, a Montague, and Juliet, a Capulet, meet at a ball and fall in love at first sight. Undeterred by their opposing families, the young lovers stow away and marry in secret. Unfortunately Romeo and Juliet cannot escape their families’ feud – Juliet’s cousin Tybalt kills Romeo’s friend Mercutio and, in a vengeful rage, Romeo retaliates and kills Tybalt. As a result of this murderous act, Romeo is forced into exile. Juliet’s parents mistake Juliet’s grief for loneliness and, unaware of their daughter’s love for Romeo, arrange for Juliet to marry another man, Paris. Juliet, seeking to reunite with Romeo, turns to Friar Laurence, who gives her a sleeping potion that mimics death. Juliet consumes this potion and fakes her own death. Through a series of unfortunate mishaps, Romeo remains unaware of Juliet’s plans. He receives the news of her death and, overcome by grief, consumes a deadly poison and dies at her side, choosing death over life without Juliet. Upon awaking, Juliet discovers Romeo’s lifeless body and stabs herself with a dagger, choosing death over life without Romeo. The Montagues and Capulets, with heavy hearts, discover their children’s tragic demise and reconcile, ending their toxic feud. Following its premiere on April 27, 1867 at the Theatre Lyrique in Paris, Romeo and Juliet by Charles Gounod gained critical acclaim as a heart wrenching and powerful operatic performance and influenced Chagall’s imagination with its successive theatrical renderings. In 1964, the Metropolitan Opera commissioned Marc Chagall to design the stage sets and costumes for its first production of Mozart’s acclaimed opera The Magic Flute. One of his favorite plays, Chagall embraced his designs as he tried to draw parallels between the Bible and Mozart’s opera. To him, they both shared the fundamental principles of goodness and truth; “For me there is nothing on earth that approaches those two perfections, The Magic Flute and the Bible,” he said. A fantastical tale of romance and adventure, The Magic Flute is an opera in two acts composed by Wolfgang Amadeus Mozart to a German libretto by Emanuel Schikaneder. One of the most beloved and renowned operas of all time, The Magic Flute was the last opera that Mozart composed prior to his death on December 5, 1791, just months after The Magic Flute’s premiere on September 30, 1791 at the Freihaus-Theater auf der Wieden in Vienna. Set in ancient Egypt, The Magic Flute follows the handsome prince Tamino as he pursues his true love, the beautiful princess Pamina. Prince Tamino is attacked by a giant serpent and saved by three ladies who are attendants to the Queen of the Night. These three ladies show Tamino a portrait of the Queen’s daughter, Pamina, and Tamino instantly falls in love with her. The Queen of the Night promises Pamina to Tamino if he rescues her from the evil sorcerer Sarastro. Tamino sets off to save Pamina with his comical comrade, the bird catcher Papageno, who also seeks true love. The three ladies arm Tamino with a magic flute and Papageno with magical bells stating that these instruments hold the power to transform sorrow to joy and will protect them on their journey. Tamino finds Pamina and the two fall madly in love. Tamino unexpectedly discovers that Sarastro is a wise high priest who has been protecting Pamina from her mother, the evil Queen of the Night. Sarastro poses three tests to Tamino and Pamina’s love: Silence, Fire, and Water. With the power of the magic flute, they overcome these tests. Papageno, with the power of the magical bells, also finds love in his soul mate Papagena. Upon hearing of Tamino and Pamina’s love, the Queen of the Night becomes enraged and attempts to break into Sarastro’s temple only to be cast out into the eternal night. Tamino and Pamina and Papageno and Papagena find peace and happiness in their love, hailing the dawn of a new era of wisdom and brotherhood. Considered by Marc Chagall the greatest of all operas, “so spiritual, so religious,” he advertised the performance by poster which is known as The Magic Flute. Following the imagery and design of this poster, Chagall created a rare hand signed lithographic edition which is one of his most famous and iconic works today. While working on design for The Magic Flute production, the Metropolitan Opera House asked Marc Chagall to create two murals in their new location at the lobby of the Lincoln Center. After thinking it over for a year Chagall agreed and in 1966, another stunning two masterpieces measuring 30 feet by 36 feet were unveiled; The Triumph of Music which is located on the South side of the Met and The Sources of Music which is located on the North side. Chagall painted the murals in his studio in Paris and had them shipped to New York once they were finished. Upon arriving to assist with the installation, Chagall was highly upset to learn that one mural had already been installed and was in the wrong location. He had specifically designed his murals so that they would complement the location and flow of patrons, but adjusted his ideology regarding his intentions as he came to like the idea of the new message, and a crisis was adverted. A gift to the city that had sheltered him during World War II, the murals received wonderful acclaim when revealed to the public upon opening. The Triumph of Music showcases composers and famous theater scenes similar to the Opera Garnier ceiling with a dominate flute playing angel. While The Sources of Music main inspiration is Mozart with David-Orpheus playing the lyre. They both are wonderful balances to each other as they embrace compositional movement and biblical themes while showcasing Chagall’s classic motifs and poetry. Taken from The Triumph of Music mural to promote a production, Carmen by Marc Chagall was produced as a poster, but also produced in a hand signed lithographic edition and is his most famous and iconic work. A tragic tale of misguided love, Carmen is an opera in four acts composed by Georges Bizet to a libretto by Henri Meilhac and Ludovic Halevy. Carmen’s depictions of proletarian life, immorality and lawlessness, and the tragic death of the main character on stage broke new ground in French Opera. Following its controversial premiere on March 3, 1875 at the Opera Comique in Paris, Carmen gained increased fame, securing its place as one of the most popular operas in the world. Set in 1820 in Seville, Spain, Carmen traces the downfall of Don Jose, a naïve soldier who is seduced by the clever and fiery gypsy Carmen. Upon meeting Carmen, Jose shuns his mother’s wishes, abandons his childhood sweetheart, and deserts his military duties, blindly following Carmen into an underground world of contraband and sin. He gives her a ring as a token of his love and devotion. Carmen toys with Jose’s love and ultimately loses interest in him, encouraging him to return to his mother and his childhood sweetheart. Jose reluctantly leaves her but vows to return and earn back her love. Carmen meets a gallant toreador, Escamillo, and the two fall passionately in love. As Escamillo prepares to enter the bullfighting arena in Seville, Don Jose returns, seeking to win back Carmen’s love. Carmen’s friends warn her of the dangers of a jilted lover, but Carmen is unafraid and desires to speak with him. Alone she confronts the desperate and impassioned Jose, who pleads vainly for her to return to him. Carmen refuses and, throwing down the ring that he gave her, she attempts to return to the bullfighting arena. Jose, in a jealous rage, stabs Carmen. She dies as applause resounds from the bullfighting arena. Consumed by guilt, Jose admits to his crime as the crowd exits the arena, swarming around Carmen’s lifeless body. With tales of love, loss, and magic set to hauntingly beautiful music, Marc Chagall’s love for the theater was magnetic. It was a medium unlike any other where his art could live and breathe, his creations could inspire and he could continue to be inspired. The homages that decorate New York’s Metropolitan Opera House and the Paris Opera speak to that love and admiration, and are known internationally as historic landmarks; a legacy that few artists are able to achieve, and one that Marc Chagall certainly deserves. Cogniat, Raymond. Chagall. Crown Publishers, Inc: New York, 1978.